Banh Sua island (Milk Cake) is an oasis within the area of The Vang islands of Bai Tu Long bay, Quang Ninh province, an ideal destination for exploration lovers. Banh Sua island is also called Ong Tam Tu Hai island, it is not a famous place such as Co To or Quan Lan island, Banh Sua is very wild with an area less than 1 square km. Looking from above, Banh Sua island is much smaller than surrounding islands so people take pictures often call it "little brother" in the great family of the hundreds of islands in Bai Tu Long Bay. The atmosphere is always quiet and peaceful. Continue your journey, you take the boat to the Quan cave about 30 minutes from the island, this place was requisitioned as a military base during the American war. There are many beautiful stalactites and stone shoots of different shapes and sizes. When the sun becomes brilliant, stop the boat by the raft houses of fishermen on the bay. 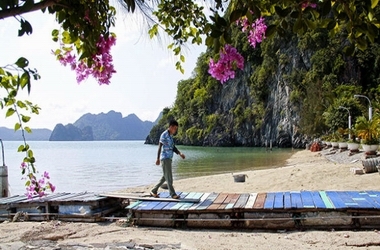 The customers can buy favourite and bring on Banh Sua island and ask local people to prepare lunch for you. The little brother in the Bai Tu Long Bay family has an area less than 1 km2, so there is no long sandy beaches like on the other islands, but in return, the water is extremely blue. You can unleash in the cool water and behold the colorful coral. In the afternoon, travelers can visit the pier area that connects with the oyster farms, go swimming and catch oysters with local people. The island has a high rocky mountain, an ideal place to admire the sunrise, beautiful sunsets and collect in sight of beautiful Bai Tu Long Bay. At dawn, the sparkling of sun, enlightens the island in the distance the island would make you surprised. At sunset the blue Bai Tu Long bay appears in mild yellow sunshine, the burning red sun slowly sink into the sea behind the mountains makes everyone admiring.